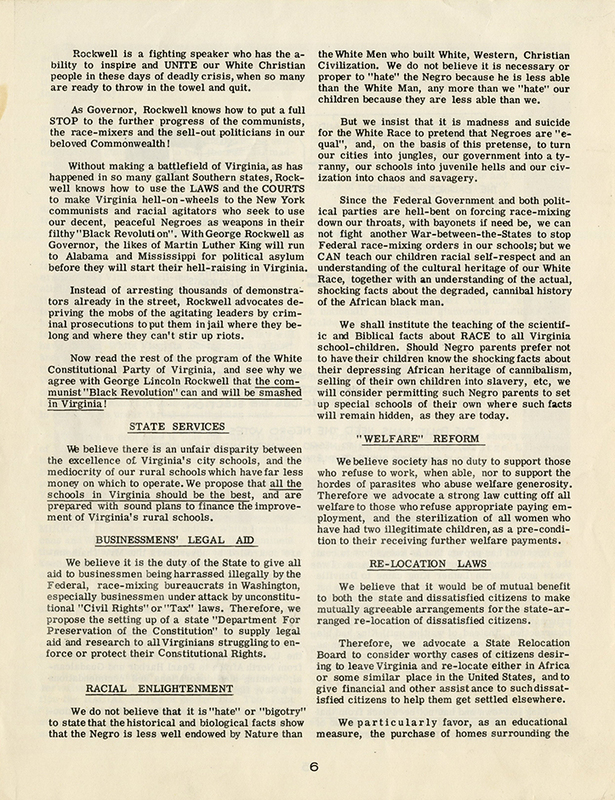 Multi-page flyer outlining the reasons why white Democrats and Republicans of the Commonwealth of Virginia should unite and vote for White Constitutional Candidate, George Lincoln Rockwell. Rockwell, the founder and head of the American Nazi Party, was well known for his white supremacist views and his knack for political theater. 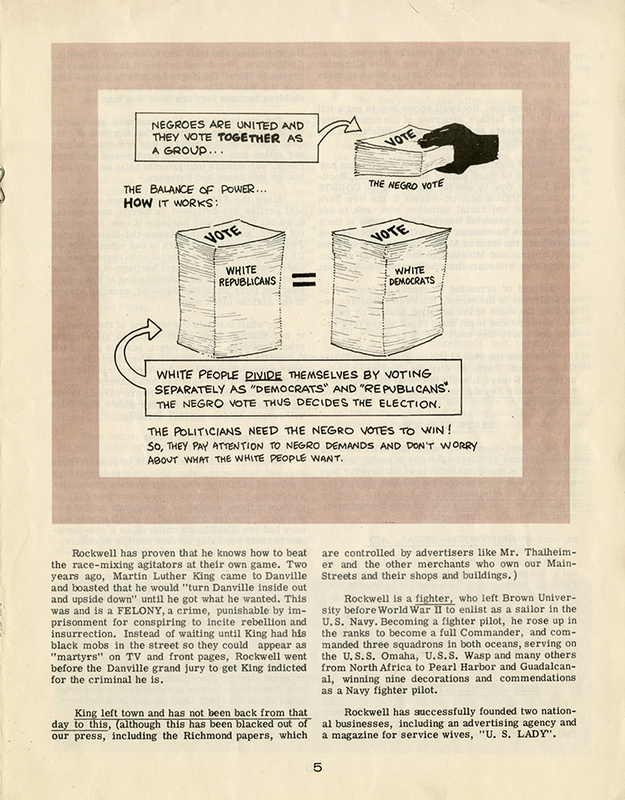 Rockwell argued that blacks would vote as a block, and that whites should do the same. 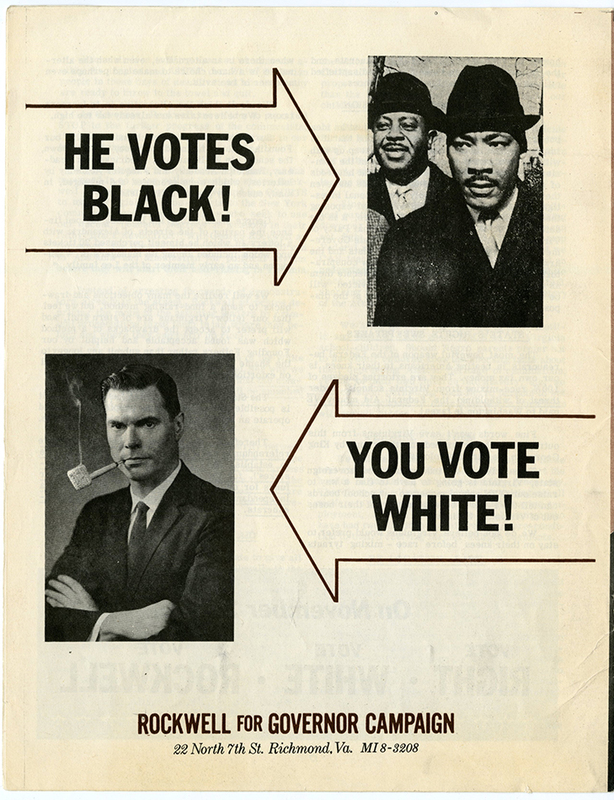 In 1965, Mills E. Godwin, Jr. won the governorship with 296,526 of the 562,789 votes cast. 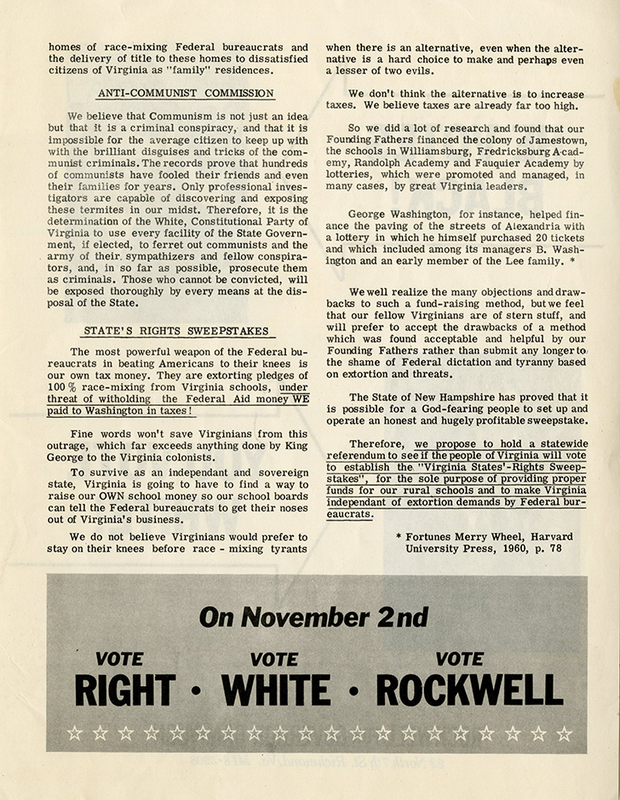 Rockwell received 5,730 votes, coming in fourth behind Godwin, A. Linwood Holton, Jr. and William J. Story Jr.
p. 3 "American liberty ORIGINATED in Virginia. We believe it will be SAVED in this state. We believe Virginia will be the first state in which Whites will have the intelligence and grit to ake a stand as WHITE MEN, instead of 'Democrats', 'Republicans', Catholics, Prtestants, rich men, poor men, labor, or anything else except WHITE MEN! White Christian Americans came to the American wilderness and turned it into a garden of civilization. Whtie, Christian Americans fought for, founded and built Virginia with their blood, sweat and tears. Although the White Man brought the black man here as a slave, he gave that black man infinitely more than he took from him in the way of labor. He gave him a religion, he gave him a higher standard of living than that of the black man's cannibal relatives in Africa and he gave him a paternal care and love unknown in the black man's Africa, where the blacks sold their sons and daughters insto slavery and ate their brothers." 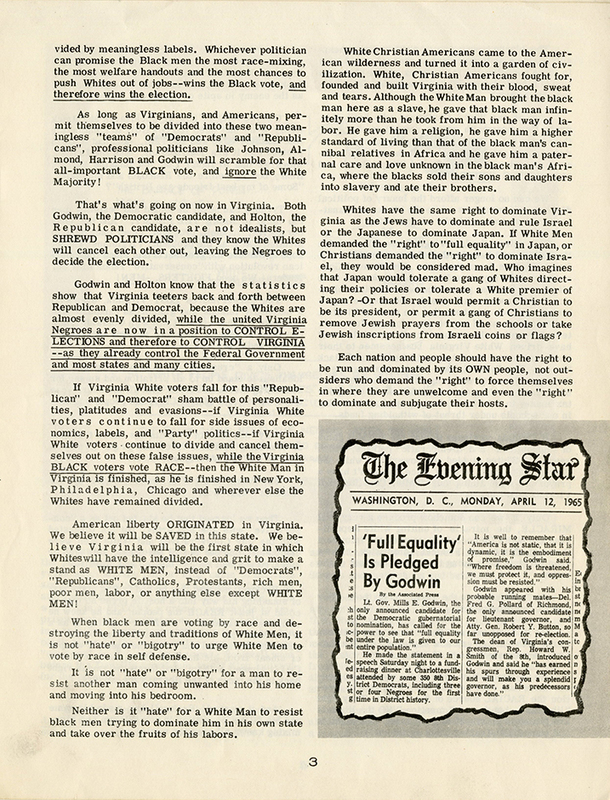 p.4 "For years, many of us were puzzled by his 'Nazism' approach. Then we learned that he started out as a 'conservative' with Joe McCarthy, but got disgusted with the way Conservatives and White Men were completely blacked out of the press, TV, etc. or smeared and blasted as 'bigots' and fascists'. Rockwell decided that he had to find some way of smashing his way into a hostile press so that he could at least REACH the people, and he knew he would be smeared as a 'Nazi' for standing up as a White Man. He concluded that the way to get the publicity we needed and knock the enemy's weapon of smear from his hand at the same time was to CALL himself a 'Nazi' and throw the smear right back in the faces of the liberal race-mixers. And it worked! Rockwell has made his name and his all-out opposition to communism and race-mixing known all over the world!" We believe society has no duty to support those who refuse to work, when able, nor to support the hordes of parasites who abuse welfare generosity. Therefore we advocate a strong law cutting off all welfare to those who refuse appropriate paying employment, and the sterilization of all women who have had two illegitimate children, as a pre-condition to their receiving futher welfare payments." We believe that Communism is not just an idea but that it is a criminal conspiracy, and that it is impossible for the average citizen to keep up with with [sic] the brilliant disguises and tricks of the communist criminals. The records prove that hundreds of communists have fooled their friends and even their families for years. Only professional investigators are capable of discovering and exposing these termites in our midst. 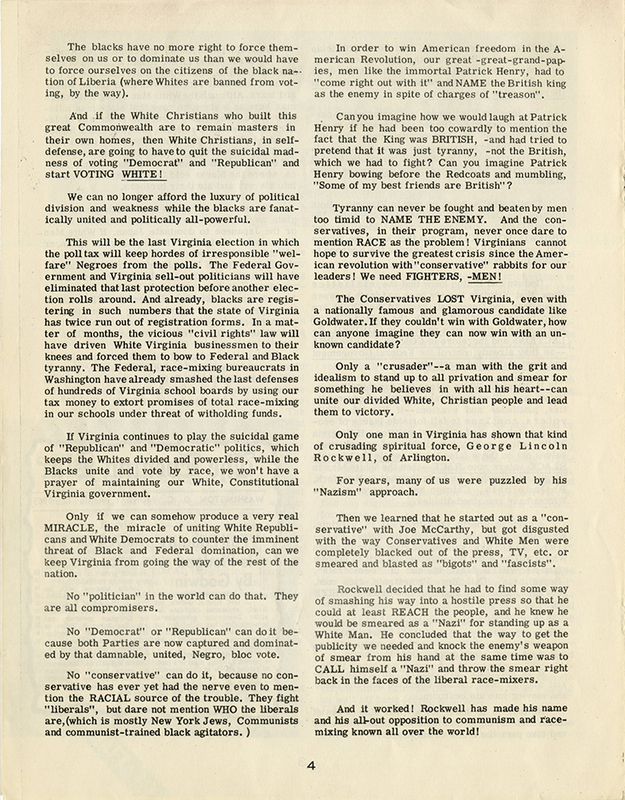 Therefore, it is the determination of the White, Constitutional Party of Virginia to use every facility of the State Government, if elected, to ferret out communists and the army of their sympathizers and fellow conspirators, and, in so far as possible, prosecute them as criminals. Those who cannot be convicted, will be exposed thoroughly by every means at the disposal of the State." Miller, M.E. (2017). The shadow of an assassinated American Nazi commander hangs over Charlottesville. The Washington Post (August 21, 2017). 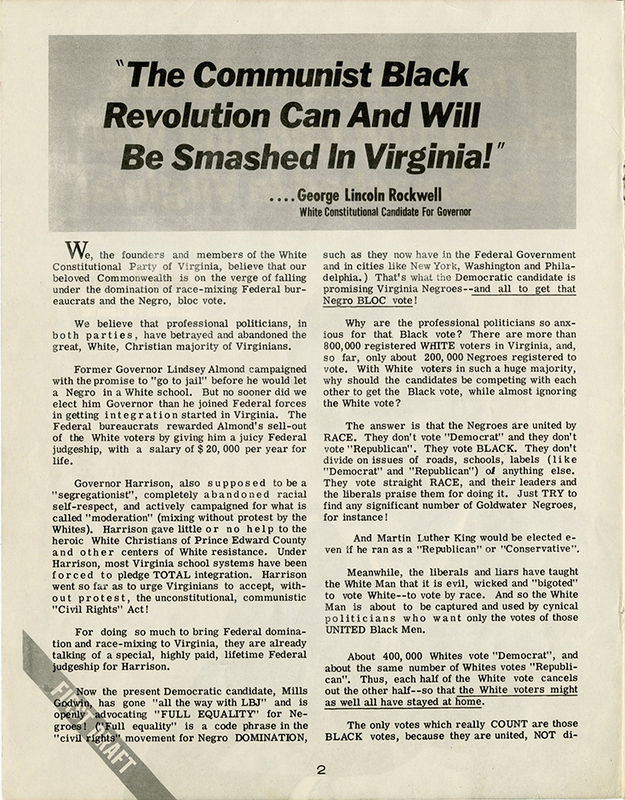 Rockwell for Governor Campaign, “"The Communist Black Revolution Can and Will Be Smashed in Virginia!" 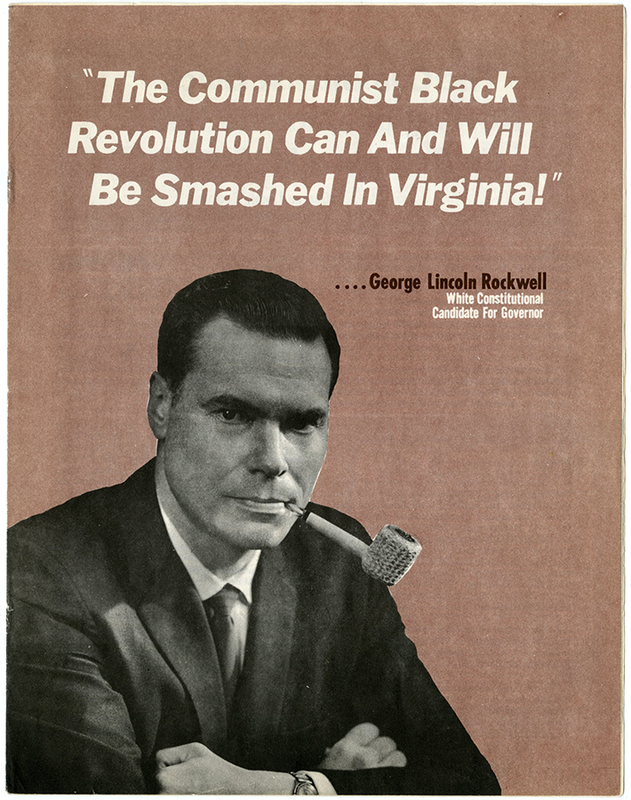 [George Lincoln Rockwell campaign flyer],” Social Welfare History Image Portal, accessed April 26, 2019, https://images.socialwelfare.library.vcu.edu/items/show/296.